Confession time: this is not a brand spanking new recipe that I just created this weekend. It’s actually an updated version of one of my very first recipes that I have been meaning to spruce up for EVER. In some ways I feel a bit sad when I updated a bunch of hideous photos on an old recipes, so I try not to change too many because it’s kind of nice to see your progress over time when you look back, but some of them are just too bad too stay! And the old photos of these doughnuts are just all sorts of wrong! Plus I really just wanted an excuse to rustle these extra-naughty little rings of yumminess up again! I have a bit of a thing for doughnuts, they’re hands down my favourite baked good of all time. And it’s actually a scientific fact that everything tastes better when it’s shaped like a doughnut. Probably. And if it’s not been scientifically verified, I am happy to conduct the necessary research! Half the fun of doughnuts to me, is that they just look super interesting and fun and delicious, especially American-style doughnuts, which seem to come in every colour under the sun, and are covered in a whole bunch of chocolates and sweets. So, inspired by the the Holy Grail of American doughnuts, Voodoo Doughnuts, I decided to make my own super over-the-top creations. But without all the processed ingredients and refined sugars. The doughnuts are pretty filling and high in fat due to the peanut butter and cacao butter, so you don’t want to go eating them everyday just because they’re raw, vegan and refined-anything free, but when you really want to push the boat out and treat yourself, these are just the things to make! 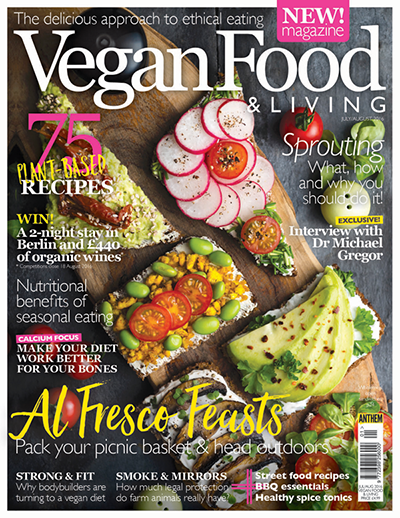 And they’re one of recipes you should make to convince any sceptics around you who believes that vegans can only eat leaves and rice; and particularly people who are sceptical of raw food! Because who could possibly resist a doughnut? And especially a PB Cup doughnut?! To make these, I used a doughnut pan to get the doughnut shape, but the mixture is so sticky and dough-like that it would be really easy to just make a sausage-shape, and then shape it with your hands if you don’t have a pan. The doughnuts themselves are very dense, chewy and oh-so moist and delicious; the secret is the dates, which bind all the ingredients together. I also stirred in some Loving Earth raw dark chocolate roughly chopped into chunks to the mixture to add some texture, and to add little bursts of sweetness throughout, and I would definitely recommend doing the same because more chocolate = extra awesomeness..! Hope you’ve all had an amazing Easter bank-holiday weekend! I can’t even remember what it feels like to have to get dressed out of pyjamas and eat anything other than Easter eggs right now! Don’t forget to come and say hi to me on Facebook and Instagram! • 1 cup (170g) dates (pitted). Blend the oats in a food processor until they are roughly ground. You don’t want them to turn into dust, but they need a tiny bit of texture. Add the dates, and blend until the dates are in tiny pieces. Add the peanut butter, vanilla, maple syrup and water and pulse until the ingredients stick together in a dough-like substance. Add a couple more Tbsp of water if necessary. Press the doughnut into the doughnut pan. I then added another small bit to the top of each one and shaped it so the top of each doughnut wasn’t flat. Stick the tray in the fridge so that the doughnut can firm-up, which takes roughly fifteen minutes. Remove the doughnuts from the pan; mine was non-stick and I found they popped out very easily just by placing a knife down the side. Make chocolate mixture by stirring together the cacao, cacao butter and maple syrup. Place 1 tsbp of the chocolate into the bottom of a small cupcake case. Make sure you put enough in to cover the bottom of each case. You should have over half your mixture left by the end of this stage. Stir together all the ingredients for the peanut butter filling in a bowl. Cover with the remaining chocolate and put them in the freezer to harden whilst you make the chocolate sauce. Mix all ingredients together in a bowl until a smooth, melted chocolate-like mixture is created. Dip the top of the doughnuts into the melted chocolate, and place on a lined baking tray, before placing in the fridge to harden. Oh Rachel, you are just the queen of raw deserts! These doughnuts look incredible:))! Another wonderful looking creation from your kitchen Rachel. I really need to gain some weight, but those doughnuts would take me a month to get through. Love the size of the peanut butter cups. I assume cashew butter could be subbed for the peanut butter? Do you make all your own nut butters Rachel? Where can I get raw peanuts from please? These look delicious, but the directions are a little confusing to me. Also, Where can I find Cacoa butter, or what is a good substitute if I can’t find it? Hi Nora, I’m glad you like them, although I’m not really sure what you’re finding confusing to be honest as I’ve separated the instructions for each individual component up to make it as simple as possible, and have made them pretty detailed, so it would be helpful if you let me know what you don’t understand. Also not sure where you are from so can’t advise you on where to buy cacao butter- but it’s sold pretty widely here in health food stores, so thats always a good place to start! Hi Caroline! Haha that is very sweet of you to say! It’s always so easy to be super critical of your own work, and I spend far too long being frustrated by photos not turning out how I’d like! I hope you do try these, they’re yummy! I am making these doughnuts at this very moment. I am excited to try them, however in a portion of the directions for the cups coating is listed coconut oil, but is not listed in the ingredient list. How much coconut oil should be used ? how did they turn out? I am really curious. They look really yummie. I’m confused. Is the very first picture on the post a picture of the peanut butter cups made on a doughnut pan? The instructions say to use a cupcake case. Have another read of the recipe Patty, you’ll see I’ve divided the different steps into different sections. The first section with the heading Raw Peanut Butter Cup Doughnuts is the instructions for making the doughnuts in a doughnut pan, and the second section that you’re looking at is for the peanut butter cups themselves, which you do need to make in mini cupcake cases. Thank you so much for replying! I looked more closely at the first picture and I realize know that there are Raw Peanut Butter Doughnuts under all that chocolate! 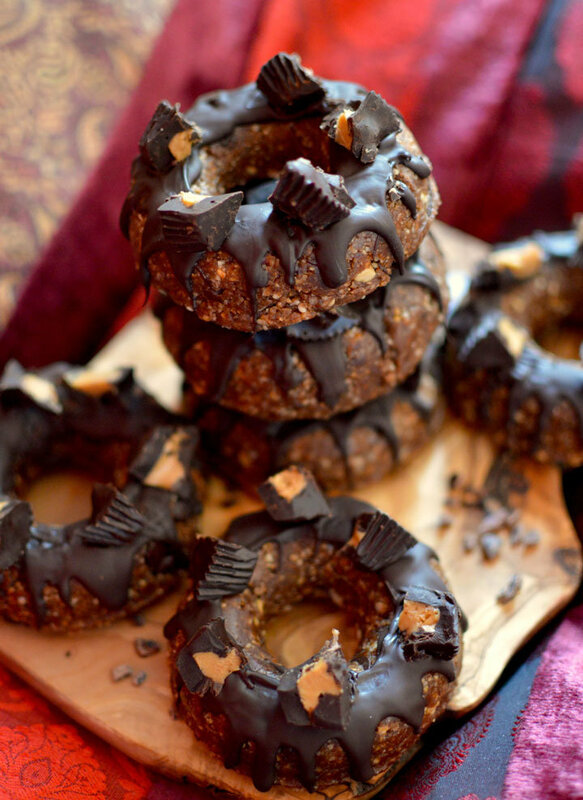 I thought the picture just showed chocolate and peanut butter, so I thought they were PB cups, but instead of a cup shape they had a doughnut shape. Sorry for the confusion and thank you so much for your help!